Quentin Shih a.k.a Shi Xiaofan, 1975, China, is a fine art photographer that also focuses on portrait, fashion and commercial photography. Since 2008 Shih has collaborated with Dior which has resulted in several impressive series. He is a self-taught photographer who lives and works between Beijing and New York. His clients include some of the major brands including Nokia and Adidas aswell as editorial clients as GQ and Vogue. In his fine art project Citizen of State he wanted to use a surrealist technique and a precise pictorial composition to depict death of ordinary people in a country fixated on heroism. 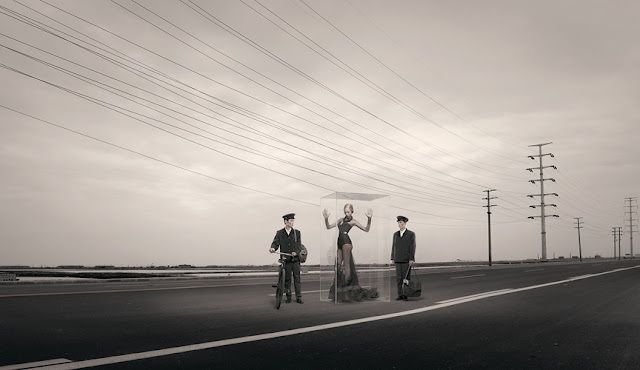 The following images come from the series Shanghai Dreamers, Citizen of the State and The Stranger in the Glass Box. This entry was posted in Uncategorized and tagged Art Photographer, Art Project, Aswell, Commercial Photography, Dior, Dreamers, Editorial Clients, Glass Box, Gq, Heroism, Impressive Series, Major Brands, Ordinary People, Pictorial Composition, Portrait Fashion, Project Citizen, Quentin Shih, Shanghai, Shi, Vogue on March 3, 2011 by Four Eyes Photography Productions.